The application of 3D modeling and 3D printing techniques to electronic circuit design and prototyping is a new and exciting method to create custom circuit boards. This project is the development of a 3D modeling library for OpenSCAD to easily produce 3D printable breadboards. For this project, the classic “Breadboard Arduino” (“SCADuino”) was created as the reference design. 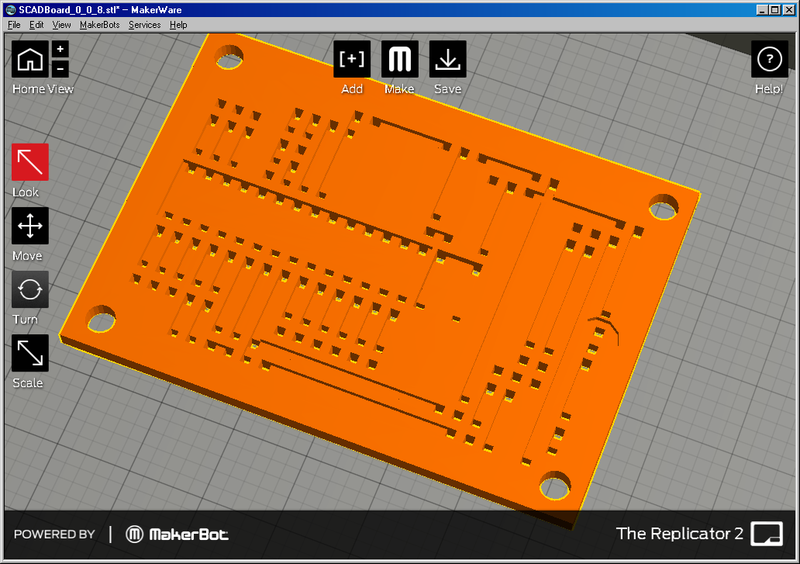 SCADBoard is a library for OpenSCAD to make prototype circuit boards. It is for companies, hobbyists, and students to make 3D models which can then be exported and produced using a 3D printer. SCADBoard is open source and fully customizable. Designing and producing custom printed circuit boards (PCB) is time consuming and expensive. Being able to rapidly design and produce prototype boards specific to your needs has advantages over outsourcing PCB production. This new method is faster and more user friendly, as it could be used through trial and error. If the first board is not perfect, it costs pennies and takes little time to fix the design and print a new board. SCADBoard is only for prototyping thru-hole PCBs. It is for creating prototype boards only. Due to the low melting temperature of PLA and ABS, SCADBoards are for low heat applications only. SCADBoard is without warrantee. DO NOT leave a SCADBoard project running unattended. SCADBoard is for low-voltage, low-heat prototyping only. Use at your own risk. We recommend keeping a smoke detector and fire extinguisher handy. Download and install the latest version of OpenSCAD from http://www.openscad.org/. These libraries have been tested on OpenSCAD 2013.06 and 2014.03 on Windows and Fedora Linux. To test, open the SCADuino_0_0_13.scad file and press F5 to see the model. Using a solderless breadboard as a reference, design your circuit board in OpenSCAD using the functions (called modules) below. We recommend using Fritzing or graph paper when documenting and designing your project. Plan out exactly where each component of your board will go, and a sketch or Fritzing can serve as an important reference model when designing the board in OpenSCAD. 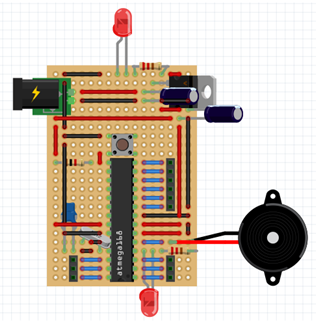 Use the SCADBoard Hole, Wire, LED, Createboard, IC modules to create your board. A complete list of required variables are in the header of the library file and sample SCADuino file. Valid column names include: blp, bln, a, b, c, d, e, 8, 9, f, g, h, i, j, brp, brn. blp, bln stand for bus left positive and bus left negative. brp, brn stand for bus right positive and bus right negative. Columns 8 and 9 are also valid columns. The SCADboard functions or methods are described below. After finishing the 3D model in OpenSCAD, press F6 to generate the model. Click Design, and Export as STL… to create a 3D printable STL file. Use MakerWare or similar slicer to print your model. If you don’t have access to a 3D printer, contact your local public school or library. If all else fails, companies such as Shapeways will print your 3D model for you for a fee. Maximize your hole placement so that most of the wires can be simply twisted together to complete your circuit. If you choose to solder your components under your board be cautious of melting the board. Plastic such as PLA has a relatively low melting point (about 230 degrees Celsius) so the average soldering iron will melt your board if you are not cautious. Description: Used to create the board. Adds a mounting hole in each of the four corners. Rows allows you to alter the number of rows of the SCADBoard measured in breadboard rows (.1”). Rows of 30 is size of a standard half size breadboard. Description: Used to create a hole. Use the variable holeLenY to adjust the hole side for 1-lead support and 2-lead support (eg: 1 wire or two wires per hole). This would create a hole at the point(h,3) based on the grid system of a breadboard. Description: Used to create a trough with holes at either end to support a wire. This would create a negative wire from (c, 21) to (d, 20). Description: Used to create a standard 4-lead pushbutton on your SCADBoard. It creates 4 holes and an indentation so that the push button sits lower to let you more easily work with its leads. row1, col1 is the upper left lead, row2, col2 is the lower right lead. colorx is the color of the indentation. Description: Used to create any type of IC, with any range of numbers of pins. 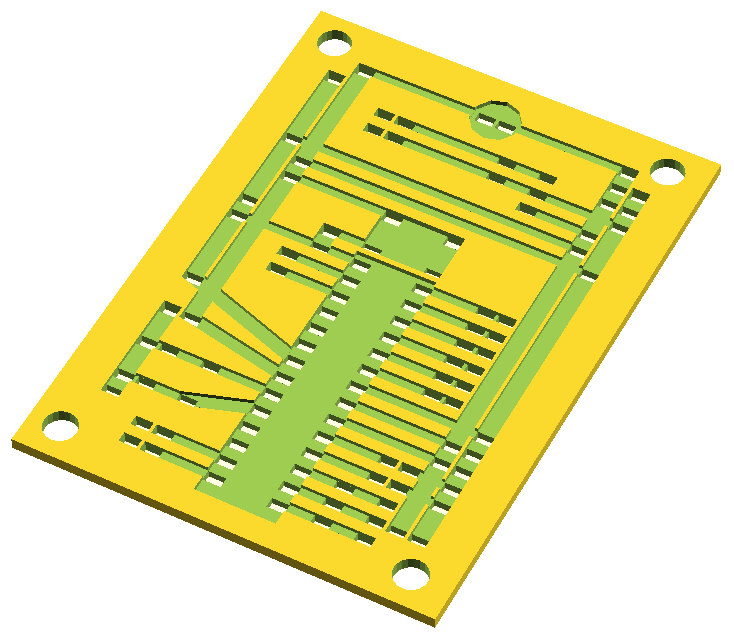 It creates an indentation so that the IC becomes imbedded in the board and lets you more easily work with the leads. Black is the color of the indentation. This example will create an IC indentation colored red with 14 holes on both the left and right column to support all the holes needed for the leads of the IC. For example an ATmega328. Description: This module is used to implement two-lead LEDs into your SCADBoard. It creates a round indentation in your board so that the LED becomes flush with the board. Note: columns 8 and 9 are used instead of the breadboard letters to put components in the center bus area. 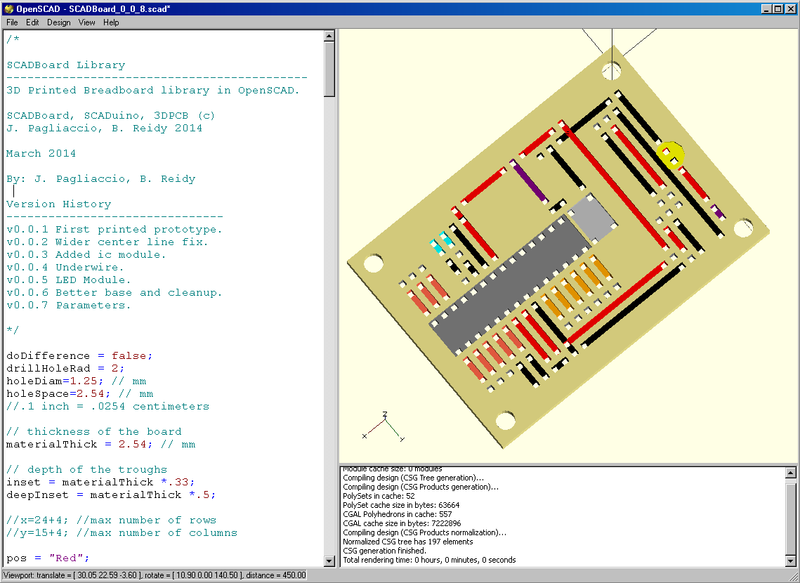 3D Printable Breadboard Library in OpenSCAD. Copyright (c) 2014,  J. Pagliaccio, B. Reidy. All rights reserved. v0.0.2 Wider center line fix. v0.0.6 Better base and cleanup. v0.0.7 Parameters for all values. v0.0.9 Separate x and y values for each hole for 2-wires-in-a-hole. v0.0.11 SCADuino with 2-wire April 2014.
v0.0.12 SCADuino with 2-wire cleanup 1/2 deep May 2014.
v0.0.13 Added license and library file. // and are here for reference. // put them in your main sacd file. // This is used for making the wires with the hull module. Arduino for all their inspirational microcontroller designs. Adafruit and Sparkfun for being reliable sources of electronics microcontroller components and all of the Adafruit tutorials. Mr.Hoppner and the LVCSD for supporting our various projects. Special thanks to our friends – the Engineers and Land Surveyors at Bladykas & Panetta for the generous donation of computers for this project. They are at http://www.panettasurveying.com. Copyright (c) 2014, J. Pagliaccio, B. Reidy. All rights reserved. Redistribution and use in source and binary forms, with or without modification, are permitted provided that the following conditions are met: Redistributions of source code must retain the above copyright notice, this condition and the following disclaimer. Absolutely brilliant. Not only is it brilliant in its own right but it is so well put together it became my “openscad” tutorial and gave me a greater understanding of openscad. I’m now starting to customise other scad files. Would love the fritzing import. Fantastic. Thanks. David, Thanks so much for your comments. We have used Blender for years, and use it as our primary modeling tool for 3D printing projects. But OpenSCAD is a great tool too, when you need precision and have repeated elements. We use Scad on Windows and Linux (Fedora) with good results. Regarding next steps, we have been experimenting with boards that are also part of the physical structure they control.